The C.A 6292 is supplied in a site-proof casing with clearly-identified connection terminals to limit the risk of errors while also allowing quick connection of your measurement leads. The measurement results are displayed instantaneously on the LCD screen, which is backlit for easy reading. The C.A 6292 can be configured using the rotary knob on the instrument or via a PC with the USB link. 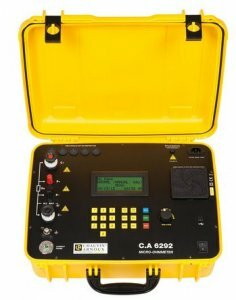 The C.A 6292 can be used to measure in total safety for both people and equipment. The BSG method allows you to maintain the earthing on both sides of the object tested in order to remove any risk due to electromagnetic induction phenomena. In this mode, the optional MR 6292 clamp can be used for current measurements up to 50 ADC. The C.A 6292 can store in memory up to 8,000 measurement results. According to Kelvin's principle, the four-wire measurement method can be used to eliminate errors due to the resistances of the test leads and the contact resistances. In this way, the C.A 6292 offers excellent accuracy (around 1% of the measurement result) for low resistance measurements thanks to its 0.1 μΩ resolution. · Verification of contact quality on circuit-breakers, switches, relays, etc. · Resistance testing on busbars, cables, windings, etc. The DataView software platform can be used to configure the instrument, process and analyse the measurement results, export saved files and create reports.